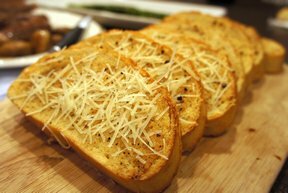 Tear apart garlic bread that uses ready made bread dough. 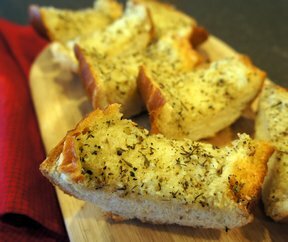 Great flavor and since the pieces are smaller, the garlic and seasonings are on every bite. In a bowl. combine butter and seasonings. Cut dough into pieces, dip into butter mixture then roll into parmesan cheese. 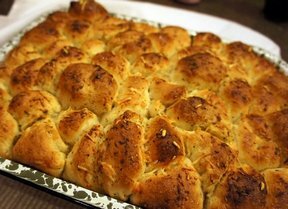 Place bread pieces in buttered 9x13 inch baking dish. Cover and let rise until doubles, approximately 1 hour. "Great recipe. I used Rhodes bread rolles and cut them in fourths. I just sprinkled the Parmesan on the top instead of rolling each ball into the cheese."